Anti-skinning agents’ mechanism is related to the prevention of coating crust in paint drying that defines the polymerization process of paint and drier effect. General anti-skinning agents add amount in terms of total amount of paint for 0.1~0.3% while add amount of varnish should be controlled around 0.25%. Decorative and industrial coatings are the primary end user of siccative that are required for drying which are based on soaps of different metals. Goldstein Research analyst forecast the Anti-Skinning Agent Market size is set to reach USD 0.97 billion by 2024, at a CAGR of 5.1% over the forecast years. The report covers the present ground scenario and the future growth prospects of the Anti-Skinning Agent Market for 2016-2024 along with the statistics of end users worldwide. We calculated the market size and revenue share on the basis of revenue generated from major players and sales of various categories of Anti-Skinning Agent from major players across the globe. On the basis of type of agent used, oximes hold the largest market share i.e. 45% in the global anti-skinning agent market owing to the increasing applications of MEKO in printing inks, industrial wood, pigment dispersions, and general industrial end-uses to prevent skinning factor. Anti-Skinning Agent Industry Outlook 2016-2024, has been prepared based on an in-depth market analysis from industry experts. 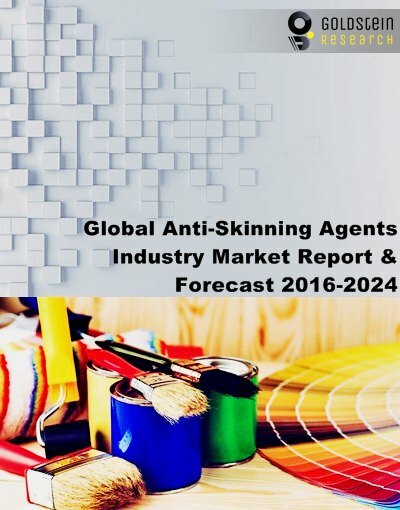 The report covers the competitive landscape and current position of major players in the global Anti-Skinning Agent market. The report also includes porter’s five force model, SWOT analysis, company profiling, business strategies of market players and their business models. Global market report also recognizes value chain analysis to understand the cost differentiation to provide competitive advantage to the existing and new entry players. Our global Anti-Skinning Agent Market analysis report comprises of the following companies as the key players in the Anti-Skinning Agent Industry: Borchers, Dura Chemicals, Gelest Inc., OMG Americas, Polyrheo Inc., GSFC Ltd., Arkema and Troy Corporation. According to the report, major driving factor for Anti-Skinning agents is the high demand for prevention of the skin formulation during storage to halt premature reaction. Increasing application in solvent borne, water borne and sprayed, the anti-skinning agent market size tends to see the new heights. Further, the report states that the major challenge is the poor formulation, production faults and processing faults stave off the anti-skinning agent market that may also result in compromise between preventing skinning and retaining an adequate drying potential of the coating after application. Based on geography, Asia Pacific (APAC) dominates the Anti-Skinning Agent market with almost 40% market share in 2016 due to growing GDP and rapid urbanization which in turn raising the demand for new and improved infrastructure and enabling the growth of decorative paints. China and India creates a highly conducive environment for anti-skinning market owing to increase in construction and printing ink end user activities. What is the revenue of Anti-Skinning Agent in 2015-16 and what would be the expected demand over the forecast period?